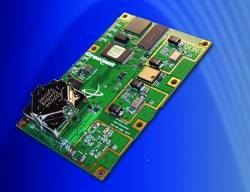 Using an FPGA baseband chipset and low-power DSP of its own design, DataGrid Inc. offers an OEM GPS/GLONASS receiver board, the DGRx-GNSS. According to the company, the receiver is capable of simultaneously tracking up to 16 L1 GPS and GLONASS signals and 8 L2 GPS signals in its standard configuration. If SBAS signals are present, up to two channels are automatically redirected to tracking those. DataGrid has developed advanced signal processing algorithms and special software architecture to enable flexible reconfiguration of the receiver channels. Using an FPGA baseband chipset and low-power DSP of its own design, DataGrid Inc. offers an OEM GPS/GLONASS receiver board, the DGRx-GNSS. According to the company, the receiver is capable of simultaneously tracking up to 16 L1 GPS and GLONASS signals and 8 L2 GPS signals in its standard configuration. If SBAS signals are present, up to two channels are automatically redirected to tracking those. DataGrid has developed advanced signal processing algorithms and special software architecture to enable flexible reconfiguration of the receiver channels. The DGRx-GNSS provides up to 20 Hz navigation solutions and high-accuracy raw data. DataGrid’s OEM GNSS technology is also incorporated into its Toughman GNSS and Mk3-Chameleon-GNSS enclosure products, which also use dual-frequency geodetic survey grade antennas of the company’s own design. DataGrid Inc., Gainesville, Florida USA.